More plushes from the past keep turning up for America, even though the current selection is still abysmally destined for the Mutant Gear Page thanks to the anti-efforts of ToyNetwork. Will 2008 be the year that USA plushes break out of the current funk and get back onto this page where people would reasonably want to collect them? Only time will tell, but you can keep watching right here for the photos of everything that's discovered. 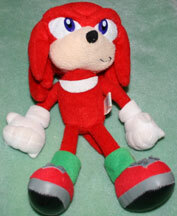 Here's quite an old plush to start things off, likely from 1991 somewhere. There are a few details that distinguish this one from some of the other early ones, making it interesting. First off, you can see that the whole doll is fuzzy, even the bottoms and stripes of his shoes. The only non-fuzz part is the eyes and gloves. 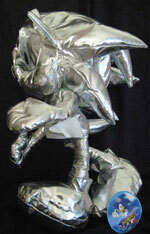 Next, the mouth of this one is quite big, but with the way it's arranged, he looks somewhat bored instead of happy. Interestingly, they've made a certain effort with the hands, giving each one 5 fingers (some dolls had 4) But look at the 'pointing' hand, it even has the fingers curled down in a 3D way. This may have also been released in the UK. This is a unique and old doll to add to your collection. Photo by OrangeUnicorn1984. Here's a fairly recent Knuckles, from around 2003. 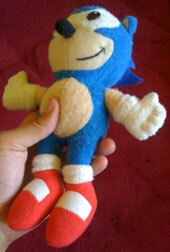 This is by Sega Toys...but as you can see here it's got some errors. First off is he's missing the yellow part of his shoes. This makes his feet look pretty strange, so it's really odd that something like that would slip by, especially since it's "Sega Toys" and not some (nefarious) 3rd party like ToyNetwork. The other error you can see is...he has FINGERS. Yes, they've actually gone to the trouble of putting a detail that's not even supposed to be there. However, otherwise it's a decent plush. Good proportions all around for the most-part, decent expression, and just fine fabric. This Knuckles and the Tails below both share sort of 3D-ish plastic eyes. The 'bead-like' things they used have a bit of depth, which you can see with the Tails. Both photos by Memeki. This Tails is from the same set as the above Knuckles plush. He has a few details (not mistakes) that make him unique. First off, the 'points' at the edge of his chest are not 3D or felt, like most others. They're represented by wavy-ness in the cut of the cloth. He has felt bangs, and a nice triangle plastic nose. Again, at the sides of his head they bothered to do actual stuffed-texture rather than use felt which gives his head more of a 3D quality. They did neglect his bands on the cuffs of his gloves, but it's not a really awful error. 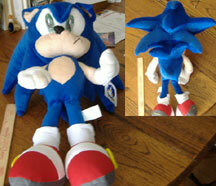 Compared to most USA Tails plushes, this one is really quite nice. It's fairly cute and well proportioned, even on the face. Plush owned and photo'd by: Memeki. Here's a Big that's not so big! This is actually only about 7 inches high. And, from looking at it, you'd hardly be able to guess that ToyNetwork made him! Just look at the detail on the fishing rod, lure, shoes and belt! They've bothered putting on all his buckles, and he even has felt accents at the top of his chest fur patch. The eyes aren't these horrible off-model monstrosities they've been using, either. The back of him fares just as well, with detailed points of 'hair' for his head, and even the spiky bit at the end of his tail. With shaded ears, and black stripes, this really does look like Big the cat. The older ToyNetwork plushes seem to pull through again here, withe their decent Eggman. Like the above Big, he's pretty well on-model especially with all the detailing they had to do for his coat. His mustache is felt, but his glasses have a shine spot on them and they paid attention to his shoes. Yes, he is wearing his signature goggles, but since they're only felt, they're flat on his head and not visible from streight on. 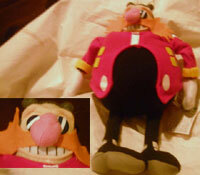 You can see his tag here too, making him the 2nd official USA released Eggman plush. Check out this cool plush! Because most plushes have the tags snipped off, here's a scan of a tag from 1991. 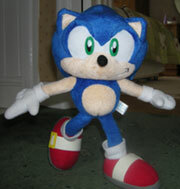 This tag was used on several Sonic plushes of the era. It looks pretty good, with the checker pattern and nicely shaded stock art. Scan by Rhia. Something ToyNetwork did, didn't go right onto the Mutant Gear? As you may or may not know, Play by Play toys is generally known for turning out mutant things. 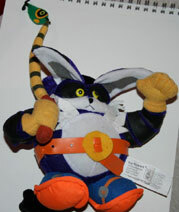 However, this Eggman plush has worked out rather well. Like the usually horrible Toy Network, this company has also managed to make a decent Eggman against all odds. With real 3D facial features, felt coat, and accents, he's not bad. Though his nose is a bit off-center, and one leg is slightly twisted. Play by Play items aren't that common, but they'll turn up nearly anywhere. This one was aquired from Spain, but they're likely not produced there. They show up in the UK, USA and obviously EU. (this is a Spanish tag) Their tag (left) gets in the whole main cast of Sonic X, with a nice die-cut bottom. 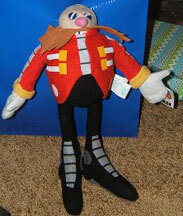 Could Play by Play be making an effort toward good plushes starting with this Eggman? We'll see...Photos by Super Silver. 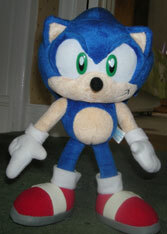 This large size Sonic plush (at least 2 feet high) is Toy Network's latest effort. While they usually just churn out mutants and monstrosities, this one is actually pretty good by their standards. It isn't wilting or suffering from a nasty face. The arms are keeping their pose/shape, and the spikes are pretty well done. The new decal-eyes are helping here. It isn't 100% free of flaws though, as the belly-patch doesn't match sides (see bottom) and the hands are pretty doughey. Also his ears have some wrinkling, but still, it certainly looks like they may be trying to shape up a bit here. This is a rather strange plush. 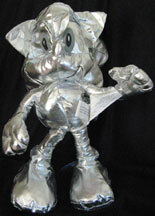 It's a Sonic...but made of all silver-tone shiny cloth. Much like the pure white Sonic & Tails from Japan, he retains none of his original color, not even for the eyes which are now just black and gray. You can see that he is official, due to the side tags and the Toy Network tag on his foot (right). While it IS interesting to see, he's still not quite on-model with his rather tall head and sideways ears. However, he's not as bad-off as many of their other dolls. This can be won at certain arcades in the USA. Both photos discovered by hypersuperchao. Here is a nice pair of older plushes. 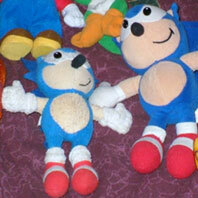 The one to the left is Avon's Sonic. 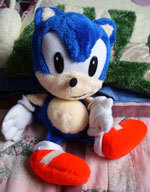 Avon sold the "finger puppet topper" Sonic theme shampoos (Seen on the Hygene page) but they also made this little plush. He's made of wash-cloth on the outside (see the texture?) & his spikes are felt. You could then presumably take him in the bath with you and wring him out when you were done! Made around 1993 or 1994, it was sold in Avon catalogs & came with a floaty ring (so he'd sit up while in the water) He isn't very big. 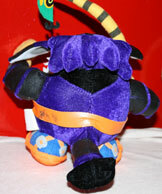 Here is a shot of the backs of 8 inch Toy Network Shadow & Amy plushes. As you can see, from the back they're pretty ok looking. Nothing super spectacular, but they do have Amy's spikes right, and Shadow isn't a mess from behind. It's the faces/fronts of the dolls that Toy Network seems to constantly mess up. So as long as you don't actually flip the dolls over...Granted, more recent efforts though seemed to want to improve them some what.